What we thought was his shoulder was in fact the back of his head. Arms stretched out and bent, back against the picture. This was of course a rare opportunity to dig deeper, and I had a lot of questions on my mind. The communication was facilitated by a wonderful person named Brenda. I've cut and edited our discussion a little here for ease of reading. Maybe you'll find some nuggets you didn't know about. I certainly did. 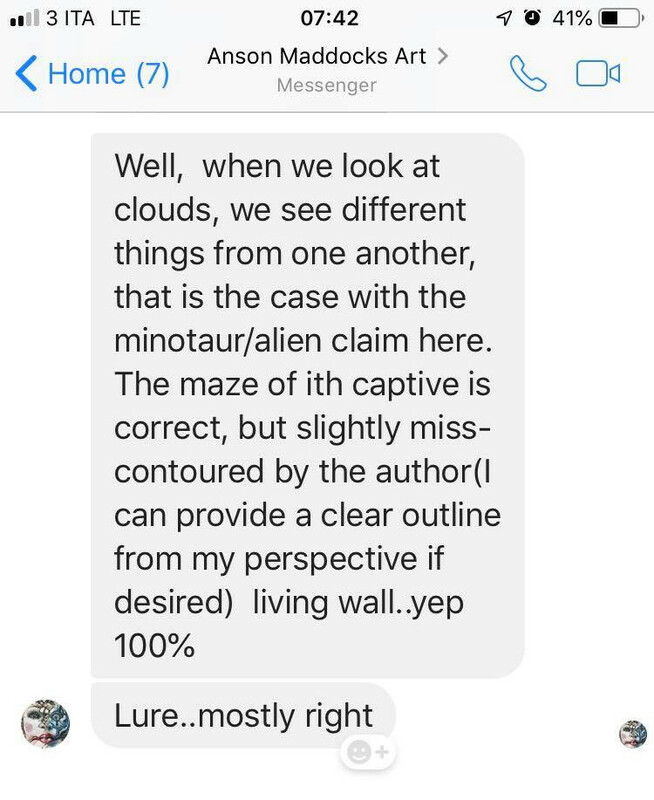 Mg: I've been wondering about the art for Onulet. 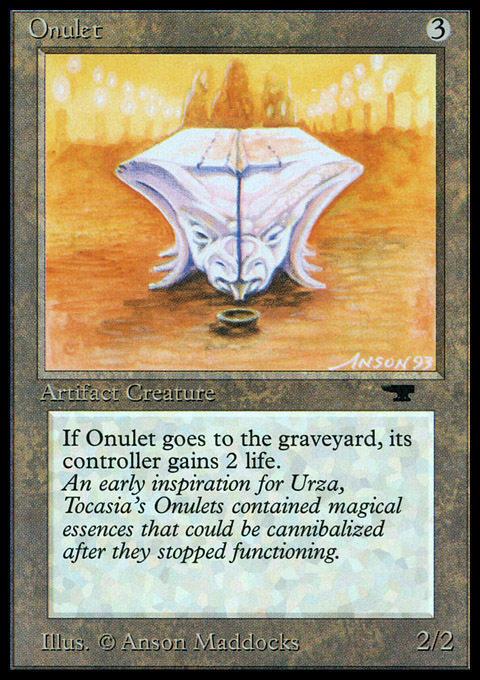 As I've heard the story, "Onulets" is an anagram of "Soul Net", but as the art only showed a single creature, the name had to be changed so the anagram wouldn't work. Is this a true story? Gain life when a creature dies. A creature that gives you life when it dies. 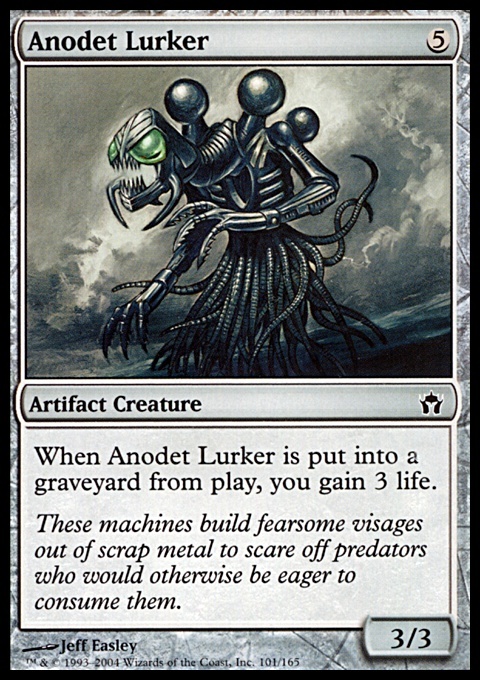 Anodet Lurker (from the first Mirrodin block) is btw an anagram of "Darker Onulet", so some shenanigans are going on here. Brenda: I can tell you about the artwork for Onulet, since Anson has discussed this with me, although I have never heard that the card title is an anagram, this does not mean that it isn't possible. I will ask Anson. What he did tell me, is that the art is a sacrificial table and that is designed so that the blood will be channeled toward the center of the table and come out from the creatures mouth and into the bowl below. It was inspired by the ancient Mayan and Aztec cultures and practice of human sacrifice. (Mg's footnote: Say what you will about the "old vs new" art direction discussion, but that's some serious steps beyond the depth of the Anodet Lurker art). 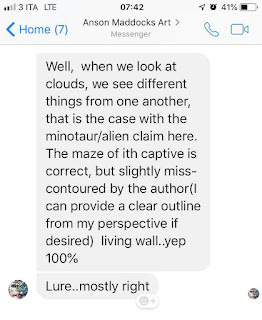 Mg: Anything about the inspiration of Llanowar Elves would be cool to hear about! The only card I own with my Coat of Arms painted on it. Brenda: I know that he was determined to produce an image of an elf that was unexpected, something which the viewer would not have likely imagined on their own, To Anson, this was something he felt was his responsibility as a fantasy illustrator. And so, to him this meant no Tolkien elves. The Llanowar Elves were never supposed to be a pretty bunch. 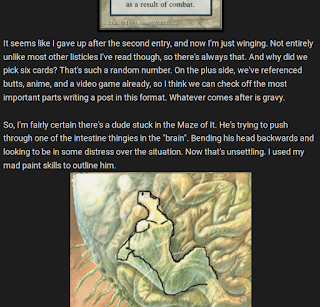 In fact, Anson had a very elaborate back story which he created in his head before doing the illustration. It involved vampires trying to take over the forest and the Llanowar Elves being a sort of half breed elf-vampire which The Forest initially wasn't sure what to do about. (Kind of like that rebellious cousin in the family which no one likes to talk about/pretends they are not related...) Anyway, the Forest decides to utilize the Llanowar against the vampires and so this is why the art depicts a sort of gritty, punk rock elf. They have been rejected and don't quite fit in and so they are fierce and have a grudge, which makes them great warriors and defenders! Brenda: Personal favorites, which I have heard Anson mention, are Cyclopean Tomb, Armor of Faith and Combat Medic. Not so much for the elements they contain, but rather the fact that with these pieces he can look at them and not be overwhelmed with thoughts of what he had wished he had done differently! (As is the case with so many of his Magic pieces.) Anson is exceedingly humble with regards to his work. For him he is constantly pushing himself to improve and to discover new methods and techniques. It is the process which matters the most to him, and the methods by which he conveys his message. And of course using unexpected concepts to portray something which may be otherwise rather familiar to us. Combat Medic was an artwork we formed a strong connection over early in our relationship. Anson asked me which of his Magic pieces did I like the best. (This was before I had become acquainted with which ones were played the most or most popular with others.) At the time, I was sorting and organizing his artist proofs for him and so I laid out a huge spread of a bunch of different proofs and examined them. 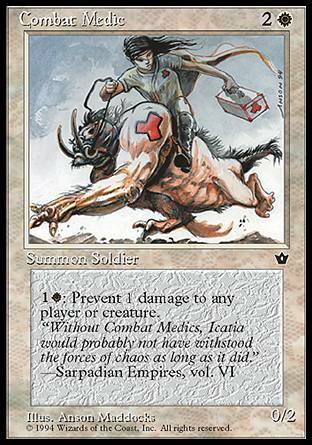 Combat Medic struck me as really the most intriguing. at the time and so I told him I really liked that one. He was quite surprised! Probably because it wasn't a particularly good card and so hasn't received much attention. But he told me it was one of his favorites too. I told him why I loved it and then he explained why he did after I finished. When he spoke I noticed a great deal of emotion welling up inside of him which I will never forget... The beast upon which the Medic is riding has a devotion and loyalty to her which goes beyond words, he told me. He is willing to put himself in harms way without hesitation, to assist her in her cause which he finds so noble and worthy. Obviously this loyalty is a quality which is important to Anson. And when I asked why the Medic is looking backward, Anson told me: Because of all of the wounded on the battlefield which the Medic must ride past in order to reach her target. She does not do so easily... She has taken an oath to save lives, but she is a Combat Medic and so she has an allegiance to a particular side. This is difficult for her and she is torn between her heart and her duties. Brenda: Ah yes! Cyclopean Tomb is so wonderful! You would be surprised at what inspired Anson for that piece. It is steeped in sexual undertones! But I would like to first address the question about mis-credits and royalty payments. In the case of Circle of Protection: Red, it seems that this error was confined to be a problem of the printers only. No royalty payments were dispersed to Anson for this artwork. Nor did he receive any artist proofs. Regarding the Revised Serendib Efreet, he did not get Jesper Myrfors artist proofs either. The way he described things back then, I don't find it surprising that there were errors like this. They really weren't prepared for the huge success the game was experiencing. It was all that they could do to try to keep up with the demand for more cards... And so the production was often rushed, sometimes more than it should have been. I had mentioned that I helped Anson to organize his proofs. That was about 4 or 5 years ago. Almost all of them were still in the boxes which they were mailed to him in from Wizards of the Coast. and so he really didn't have much of an idea what he had, as far as artist proofs were concerned. 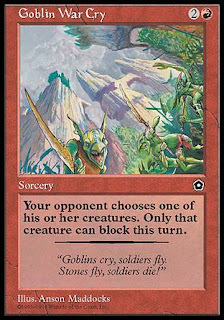 We discovered that he never received any artist proofs for Goblin War Cry, (Portal Second Age) which was credited to another artist, Michael Weaver. Maybe he got the artist proofs... We don't know. We kept talking about the Tomb. And as this is a family friendly site and Brenda is a wonderful human being, possibly disclosing some information about the art that had never been publicized before, I'll shy away from stating that these are direct quotes to keep possible innuendos at a minimum and keep us guessing. 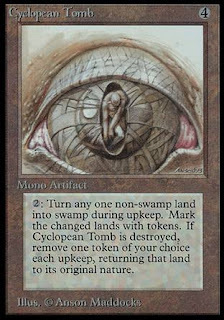 A Cyclops is a one-eyed monster, which can be an euphemism for the male phallus. The figure inside of the eye, has no face to speak of, only one eye. And "the Tomb" of which the figure is inside, (the eye itself), is a Yonic representation. This is brilliant art. And this is truly something I will not unsee. The art somehow became even more awesome. 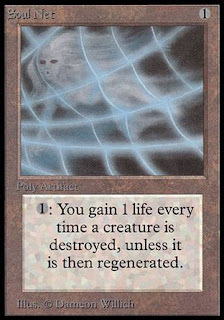 Our conversation steered into the legendary denim jackets, and further about WotC and Hasbro's work with Magic artists today, even discussing the ongoing "artist boycott" from many CFB events. And I must say I am impressed with their take on the situation. There was simply no resentment to be heard, just pragmatism and humble professionalism. Brenda: "I don't see [CFB] as being "unfair" or conducting themselves in an objectional manner toward artists. The fact of the matter is that certainly there has been a shift in how artists fit in to large events, but it has been a natural and organic transition. 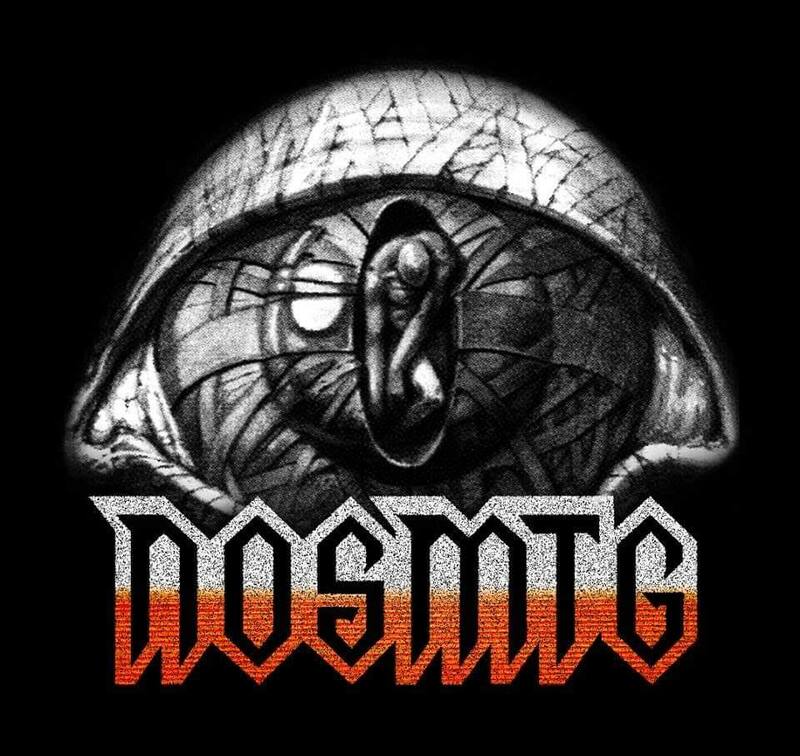 There are literally THOUSANDS of Magic artists now. In a sense, we have become vendors (whether we like it or not). [...] I understand the issues the artist are complaining about but I don't think the boycott was very well thought out. If I were trying to make a public statement about an issue I wanted to change, I think it's wise to first identify your objectives and at the same time propose definitive paths of resolution. Otherwise you become just another voice in the din complaining about_____ (fill in the blank with whatever because it probably won't matter anyway). I love the support of the artists by the community, the shift toward purchasing directly from artists websites and the raised awareness about what it means to be a professional artist. These are the positives that have come from the boycott and I do respectfully acknowledge their value." I mean, that is a highly professional way of addressing the climate. And I can assure that meeting Anson could be a reason for me to finally visit a GP. 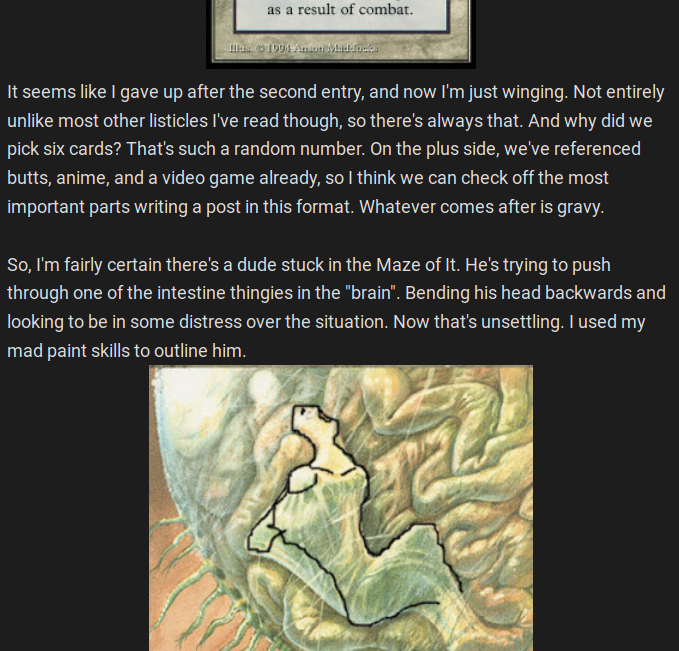 Wouldn't mind the opportunity to get some sketches on that guy stuck in the Maze.